Hello again from Roadtrip-'62 ™ . Don Milne here once again as we head out on our twentieth day of travel along historic US-6. Yesterday, we traveled 77 miles from Joliet, Illinois to Princeton, Illinois. Today we leave the quiet rural areas and hit a big city. As usual, that means museums, and a few surprises. We also enter the West, as we cross the Mississippi River. There will be no more colonial era sites out here, and everything begins to get a bit newer than it was in the East. If you see anything you like, get yourself out on the road and enjoy it in person. You might be having fun on this virtual roadtrip, I know I am, but there's nothing like the real thing! At any time, click on an underlined word below to learn more about the places on the trip. Let’s get back on the road again! Today we’re waking up in Princeton, Illinois. I’m going to try the Coffee Cup Restaurant for breakfast. It’s located off of US-6, at the north end of town, which probably explains why I didn’t find it for dinner last night. The Coffee Cup has a great 1960s style sign and looks like an old drive-in, so it’s probably old enough for our patronage. After breakfast, let’s drive around town a bit before we leave. Princeton is yet another town with an old, working theater downtown, the Apollo Theater. It was originally mainly used as an opera hall and vaudeville stage until a movie projector was installed around 1910. The theater nurtured one of the great American organists, Virgil Fox, who practiced there as a youth because his father owned the theater. Virgil played both during movie productions and during the daytime hours when the theater was dark. From this beginning, Virgil Fox went on to win awards and give recitals on practically every important organ in the world. 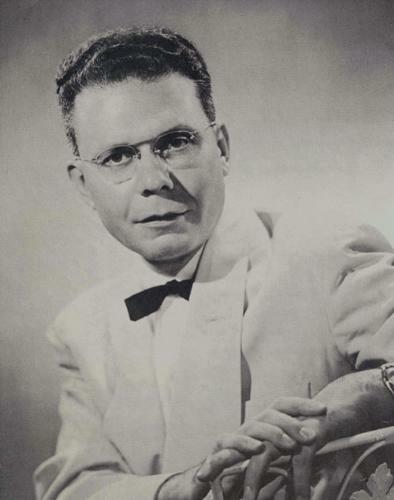 In 1962, he appeared with E. Power Biggs and Catherine Crozier in the inaugural concert of the Aeolian Skinner organ at New York City's Lincoln Center. By the 1970s, he had formulated a new style of delivery for his performances, speaking to the audience from the stage. I remember seeing him in one of his live "Heavy Organ" concerts of that decade, where he performed the music of Johann Sebastian Bach, discussed the music between numbers, and was accompanied by a light show! It was an amazing performance. Another famous resident of Princeton was actor Richard Widmark. Widmark graduated from Princeton High school in 1932. His movie career spanned the years from 1947 through 1991, during which he was largely cast in gun-toting roles such as cowboys, policemen, gangsters and military men. He appeared in the 1962 movie “How the West Was Won” along with Gregory Peck, Debbie Reynolds, James Stewart, and John Wayne. Besides such personal history, Princeton also holds local history at the Bureau County Historical Society. The society occupies three historic buildings, acquiring the first in 1946, so the museum is old enough for us to stop at. The Clark Norris House was the first, with the Newell Bryant House acquired in 1998 and the Matson Library building being the most recent addition. In these buildings, the Bureau County Historical Society holds a varied collection including Native American artifacts, farming equipment, Civil War and military memorabilia, and ephemera of bygone days. It is also home to the Henry W. Immke photography collection of equipment and over 20,000 glass photograph plates. Mr. Immke was a local photographer from 1866 until 1923. Speaking of the Civil War era, Princeton also had a station on the Underground Railroad, moving slaves from the South to freedom in the North. The Owen Lovejoy Homestead was opened as a museum in 1972 and is now open for tours. Princeton’s Courthouse Square has a monument originally dedicated to Civil War Veterans of Bureau County in 1913. Today it has been rededicated to all Bureau County veterans. This granite and bronze monument is 50 feet tall and is topped by a winged victory statue. We leave town with US-6 traveling together with US-34 as far west as Sheffield, Illinois. Highway US-34 runs 1,122 miles from Berwyn, Illinois to Granby, Colorado. Back in 1962, it began 17 miles further east in Chicago. Through Rocky Mountain National Park it is known as Trail Ridge Road because it runs atop some of the mountain ridges, reaching an elevation of 12,183 feet. This makes US-34 the highest paved through highway in the United States. It’s so high that snows force it to close entirely from mid-October to Memorial Day in May! Wyanet, Illinois is next down the road, a town that once had a three-story train station. This was due to the fact that the Burlington Railroad passed over the Rock Island Rail Road. Wyanet is still a prime area for train watchers to photograph trains because of the high trestle bridge of the Burlington Northern Railroad. Another scenic spot is the lift bridge which allows the Hennepin Canal to pass over Little Bureau Creek. The Hennepin Canal joins the Mississippi and Illinois rivers. While the canal was originally an important transportation waterway, connecting to the Illinois and Mississippi Canal we have been traveling alongside, since 1951 it has largely been a recreation destination. Today, the Hennepin Canal Parkway State Trail is a segment of the 6,800-mile American Discovery Trail which travels from coast to coast. There is a visitor center between Wynet and Sheffield that’s too new for us to visit. Or, if you want to spend the day fishing, the canal is stocked by the State of Illinois with a variety of species including bluegill, crappie, walleye or bass. Sheffield, Illinois is the home of St. Peter Danish Evangelical Lutheran Church, the oldest Danish church in the United States. The congregation disbanded and the Sheffield Historical Society began preservation work on the church in 1967. It’s likely that in 1962 we would have seen a church in somewhat poor repair, with a very small congregation. Upon completion of the restoration work in 1976, Queen Margretha XI of Denmark and her husband, Prince Henrich, visited to celebrate its reconsecration. West of Sheffield, the railroad runs alongside US-6. I’ve always loved stretches of highway where the railroad runs with them, and I don’t know why. Something about the road and railroad together, traveling through open farm fields, just calls me to follow on and on. Here, we follow the railroad only as far as Atkinson, Illinois. But first, we drive through Mineral, Illinois, another of the many small towns in Bureau County that were founded on coal mining. Mineral derived its name from the mines and was the first of the coal mining towns. Coal was discovered here in 1834 and all the mines closed before the end of the 19th century. Lack of industry contributed to population loss, and by 1961 the local high school enrollment was 28 only students. This was four students short of Illinois’ guidelines, so the Mineral school district was annexed to the nearby Annawan school district in 1962. About this time, the I-80 freeway was being planned north of town. Rumor has it that the Mineral town board was given the opportunity to have an interchange but they passed it up because they thought the type of traffic the new highway would bring would be bad for the town. Instead of any growth, they soon discovered that the freeway took away all the former through traffic on US-6. As we leave town, we pass a testament to the former traffic, a small, 6-unit, abandoned motel building on the south side of the highway, across from the grain elevator. Grain seems to be in plentiful supply around here, in fact you could say they grow so much corn out here that they burn it! Just beyond that abandoned motel is the Patriot Fuels ethanol plant, where they turn corn into ethanol for fuel. We’re entering that part of the Midwest known as the Corn Belt, because so much of the agricultural land is used for growing corn. These ethanol plants are a recent development out here, and are dependent on government price subsidies, government mandated ethanol useage requirements, and loans for land and infrastructure. Additionally, vehicles will typically go 3-5% fewer miles per gallon on ethanol-blended gasoline than on 100% gasoline. Turning corn into fuel is expensive and the market doesn’t yet support the cost. It will be interesting to see if it ever will, or whether these will become ghost industries in the future. We’ll just drive through the next two small towns, Annawan and Atkinson, Illinois. If it were lunch time, we might stop at the Purple Onion in Annawan, just because it has a great old-style Pepsi sign on the front. Otherwise, let’s keep heading west to Geneseo, Illinois. You could stop and see a movie at the Central Theatre, as it’s been here since 1924. It was formerly known as the “Geneseo Theater”, perhaps still in 1962. The Geneseo Historical Museum is too new for us, as it was only established in 1972. However, they have a nice bronze bust of Abraham Lincoln that was originally commissioned by the French government in 1928. The statue was displayed at Chicago’s Union Stockyards until 1997, when a local resident made it possible to move it into the museum’s new building. Geneseo is also home to another historical organization, the Antique Engine & Tractor Association (AETA). The AETA has been holding tractor shows in the area ever since 1959, recently moving to a new show grounds about 9 miles north of town. On September 12-14, 2014, they will hold their 53rd Antique Engine & Tractor Working Farm Show, where you can see farm equipment as old as the early 1900s. We’re still too early for lunch, but if you come later in the day you might want to try the Cellar Restaurant. The Cellar opened in 1960 and today features candle lit tables, local artists’ paintings on the walls and a glassed-in kitchen where you can watch your meal being prepared. Instead, we’re on our way to Niabi Zoo in Coal Valley, Illinois. The zoo is the legacy of local masonry contractor Gordon McLain, who began work on it in 1957 and opened the zoo to the public two years later. In 1963 Mrs. Charles Deere Wiman purchased the land and more adjacent and donated it to Rock Island County. Today, it’s run by the non-profit Niabi Zoological Society and its focus is still on exotic animals, as it was in Gordon McLain’s time around 1962. The zoo’s big attractions are giraffes and of course, a zoo train! After a morning at the zoo, it’s back on the road to a junction with US-150. In 1962, that highway traveled together with us to downtown Moline and then west to Rock Island, Illinois. But in about 1977 it was shortened back to this US-6 junction. The east end of US-150 is 571 miles away in Mount Vernon, Kentucky. We turn north here, right in front of Quad City International Airport. It’s rather strange how the area acquired the Quad City name: there are actually five cities here, not four. About the time of World War I, Davenport, Rock Island, and Moline came to be known as the Tri-Cities. During the 1930s, East Moline was included and the area was called the Quad Cities. The oddity occurred after 1948, when an Alcoa aluminum plant opened in Bettendorf and that city surpassed East Moline in size. There was discussion of adopting the name Quint Cities but Quad Cities had already become so well known beyond the area that Quint Cities never caught on. So we’re stuck with a name for four cities that covers five cities. We will pass through three of the cities: Moline, Bettendorf, and Davenport. East Moline and Rock Island are left to be covered with other US-numbered routes. We enter Moline first, crossing the Rock River on the old 27th St Bridge. Just east of us is the I-74 freeway, which is also US-6 today but it was not open in 1962. Moline is of course most famous as the home of John Deere farm equipment. Mr. Deere was a blacksmith in Grand Detour, Illinois whose first innovation in farm equipment was the cast-steel plow, which he pioneered in 1837. It cut through the dense, clayey topsoil of the Midwest much better than iron plows. His second innovation was in the business model he used. Traditionally, farm equipment was produced as it was ordered. But John Deere instead manufactured plows before they were ordered and then offered them for sale. Customers were therefore able to see what they were buying beforehand, and word about his product spread quickly. The Moline location supplied great transportation for his mass-produced products via the Mississippi River, the Illinois And Michigan Canal to the Great Lakes, and the new railroad that arrived in 1854. The railroad also brought thousands of immigrants to the area. In the 1850s they were mostly Swedish, Belgian, and German, which reflected areas of economic problems in Europe. For a time, Moline had the second largest Belgian population in the country after Detroit, Michigan. Other farm equipment manufactures located near the Deere factories, including Caterpillar, Case, and International Harvester, making the Quad Cities the “Farm Implement Capital of America”. During the rest of the 19th century and most of the 20th centure this situation prevailed, until the farm crisis of the 1980s. This crisis crippled the farm implement industry as plants laid off thousands of workers and unemployment in the area soared to twice the national average. Even Deere & Company, which maintained its world headquarters in Moline in facilities that opened in 1964, moved most of its factory operations out of town. Even so, Deere & Company is still the largest employer in the city, with 6,300 employees in 2009, according to the City of Moline. Before we start exploring Moline, we need to stop for lunch. If we had come in 1962, we could have headed to East Moline and had lunch at Mr. Quick Hamburgers. The first one opened here in 1962 in a building that is now the Yen Ching Express oriental restaurant. Mr. Quick grew to a 300-store chain with restaurants from Texas to Minnesota. Today there are only five locations remaining, all in the Muskegon, Michigan area. I suppose we could eat here just to enjoy the building, but I’d rather enjoy my lunch. So let’s stop at the Moline location of Lagomarcino’s. Lagomarcino’s has been a soda fountain since 1908 and a candy store too, since the 1930s. It still has the beautiful, handcrafted mahogany booths that were custom built by Moline Furniture Works in 1918. The metal ceiling is even older, and the Tiffany lamps for each booth were designed in New York. Even the blue flowered hexagon terrazzo floor is beautiful, and is local to boot, installed by Cassini Tile of Rock Island. You can enjoy soups, salads and sandwiches, but leave room for dessert! After all, this is a soda fountain with ice cream. They even have their own signature soda, a Lago. This beverage is supposed to be similar to Dr. Pepper, my favorite, and was developed by Charlie Lagomarcino in the 1920s. Bon appetite! Afterwards, we’re going to visit the John Deere Pavilion, which opened in 1997 but showcases the history of the company with exhibits of past and present John Deere plows, tractors, combines, and other machinery. It’s more than a museum, tracing the progression of family farms and even offering a virtual tour through the local factories named Harvestor Works. The Pavilion is part of the John Deere Commons in downtown Moline and one of the largest tourist attractions in the area. You might notice that downtown is much emptier than it once was. In 1962, it was still a bustling place, as the local shopping malls didn’t open until the 1970s. For example, the SouthPark Mall that we drove past on the south edge of Moline opened in 1974. Even before the malls though, stores were moving out of downtown. The Sears store moved to King Plaza on 23rd Avenue (now known as Avenue of the Cities) in 1962. It was accompanied by S. S. Kresge (in its pre-Kmart days), Kinney Shoes, local clothing stores Mosenfelder's and Goldsmith, Walgreens Drug, and A&P Grocery in a typical strip plaza arrangement. King Plaza is still open with stores today including Ace Hardware and Walgreens Drug, both old brands, so it’s a good place to stop for supplies if we need anything. And just about a half mile further east is a chance to play some miniature golf! Moline Mini-Golf may have been developed about the same time as the stores on 23rd Avenue. It is a flat, simple concrete layout like we might have seen back then, so I’m going to go ahead and play. I just can’t pass it up! After golf, let’s head over to the Rock Island County Historical Society Museum. The Rock Island County Historical Society was originally created as the Illinois Historical Society in 1899. Twenty years later they began to display their artifacts at the Rock Island County Court House, but had no permanent home. 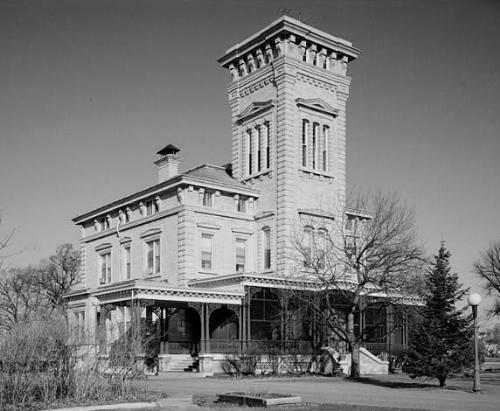 Finally, in 1962 Mrs. Charles Deere Wiman purchased the Atkinson-Peek house and presented it to the Society for use as a library and a museum. The museum opened four years later, so we would not have seen much in 1962 because many artifacts were held in storage at the Hauberg Civic Center back then. The museum is still in the Atkinson-Peek House, which is an 1878 building with extensive remodeling from 1910. Today we can stop and see an extensive collection relating to local history. Our highway US-6 ends up as the frontage roads on opposite sides of the I-74 freeway as we approach downtown and from a distance you see the LeClaire Hotel building. Another big change in downtown since 1962 is the fate of this building, once the tallest in Moline. In 1962, the LeClaire Hotel was a luxury hotel and hosted celebrities and even President John F. Kennedy. It hung on, eventually closed in the 1980s, and then sat vacant for 10 years. It has since been renovated into apartments as the LeClaire Apartments. Opposite the LeClaire, on the corner of 5th Avenue, is a Cenex gas station which amazingly was open in 1962! I almost never find these, but the photo of LeClaire Friendly Service Mobil Station above matches this station. Time to buy gas, though we won’t get anyone to check our oil or wash the windows as we would have back then. After a fill-up, use of the restrooms, and grabbing a soda, we’re back on the road as US-6 comes up to the Mississippi River on 19th Street. There is no direct connection from 19th St to the I-74 freeway bridge at the river, though there would have been when the bridge was built in 1935. Today, the old highway of 19th St ends at the water filtration plant. The I-74 bridge was originally known as the Iowa-Illinois Memorial Bridge and is often called The Twin Bridges because there is now a pair of suspension bridges across the Mississippi River. The first bridge was constructed in 1935 and opened as a toll bridge. We would have seen both spans on our historical trip because the identical second bridge was opened in 1959. Both were upgraded to carry interstate freeway traffic in the mid-1970s and today they are the most heavily traveled bridges in the Quad Cities, though they do not meet current interstate standards. Construction of a new bridge is slated to start in 2017 to remedy the situation. Once across the Mississippi River, we find ourselves in Bettendorf, Iowa where we meet US-67. The north end of this route was at Dubuque, Iowa during 1962, but today this highway runs 1,560 miles from Sabula, Iowa to the United States-Mexico border at Presidio, Texas. On its way, US-67 crosses through the heart of the Ozark Mountains and near the south end it passes through an area of Texas with many mountains over 6,000 feet high. The route experienced a change in 1962 when a new bridge over the Illinois River at Beardstown was constructed. We’re going to head west a couple of miles along it into Davenport, Iowa, to make a stop at the Rock Island Arsenal. This facility lies on an island in the Mississippi River and is the United States government’s largest manufacturing arsenal. The arsenal was founded in 1862, a nice round one hundred years before our trip. There are actually some tourist attractions within the arsenal that we could have visited in 1962. So we’re going to see them today. Rather unusually for a museum and because Rock Island Arsenal is an active military installation, visitors 16 years and older must have a valid photo ID to enter. Foreign nationals must have a passport or alien registration card. But we’re in and first up is the Rock Island Arsenal Museum of weaponry, established in 1905. It’s the second-oldest US Army Museum: only the West Point Museum is older. The museum has over twelve hundred US, foreign, civilian, and military small arms on permanent display. The museum’s primary mission is the history of the Rock Island Arsenal and Arsenal Island. Its secondary mission is the history of small arms. The has a 1962 connection also, as that was the year that all US Army Museums were placed under the authority of the US Army Center of Military History (CMH). Other places we can see are the reconstructed Fort Armstrong Blockhouse, Colonel Davenport House, the Mississippi River Visitor Center, and both the Lincoln National Cemetery and a Confederate Cemetery. The Fort Armstrong Blockhouse is a reconstructed building from a fort that was established in 1816. It was one of a series of forts built to protect the Mississippi River Valley. The Colonel Davenport House is Rock Island’s oldest house, constructed in 1833. The Mississippi River Visitor Center overlooks Lock and Dam 15 and affords a great spot to watch boats pass through the locks. In recent years, you might be lucky enough to see the many Bald Eagles that flock to the lock and dam area to feed from January to March. Besides having tourist sites, the arsenal is the only active US Army foundry. It still manufactures ordnance and equipment, including artillery, gun mounts, recoil mechanisms, small arms, aircraft weapons sub-systems, and grenade launchers. We only have time for one of these sites tonight after the museum, so let’s leave the rest for a future Roadtrip-‘62 ™ highway US-67. Well, once again things are closing for the evening and it’s time to find a motel and dinner. Let’s head back up US-67 to Bettendorf, so we can get back to US-6. Our old route gets off the I-74 freeway and uses Kimberly Rd north and then west across town, even in 1962. I did find a couple of old motels in Bettendorf. The Traveler Motel has a nice concrete block screen wall, but it also includes a video rental store. Doesn’t quite seem like my type of place. The Twin Bridges Motor Inn also has a nice concrete block screen wall and a great sign, but it looks more late 1960s, so I’m heading farther out US-6 into northwest Davenport, Iowa. Some of the old motels along US-6 are of course gone, such as the El Rancho-Tel Motel, which bragged it was “Iowa’s Finest Motel” on the sign. Another place I’ve seen a great postcard of was the Tall Corn Motel. What more fitting name for a motel in the farming heartland of America? The Tall Corn Motel, a Best Western motel, was torn down in the 1980s for a Hardee's Restaurant, so we’ll have to search a bit more. Actually, there is not much development along parts of US-6 through Davenport, and much of what we do see is newer than 1962. This road was an early bypass of the downtown area, where all the development still was back then. Maybe this is another night for modern chain motels, as even the US Route 6 Tourist Association (Iowa) lists nothing but more modern motels for the Davenport area on its itinerary for their October 2014 US-6 River To River Cruise. After dinner, I usually watch some TV before bed. It’s too late in the evening, and too late in the century, to watch Captain Vern’s Cartoon Showboat, but if I grew up in the Davenport area in 1962, I’d surely watch it after school. Like most cities then, at least one local channel showed cartoons after school. A boat captain was a popular motif for the host because most of the stations showed Popeye cartoons. WOC of Davenport had the Showboat, which began in 1953 and was created and originally hosted by Ken Wagner. Beginning in 1960, Captain Vern Gielow was the host until 1963. Don Warren took over for a season and then the show settled into another longtime host, Captain Ernie Mims. This video shows Ernie and parts of the set, which remained in storage in the TV station’s basement until it was donated to the Putnam Museum in 1996. The museum has used it twice in exhibits. So sit back and imagine your favorite cartoons as Captain Ernie shows us around backstage.